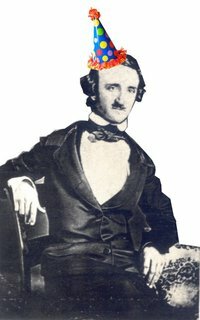 Holly's Horrorland: Happy 202nd Birthday, Edgar! I live in Richmond, VA and I've never been to the Poe Museum either! What is wrong with me?! Okay! :) Looks like there's an event every month during the Spring/Summer! great post. I wonder how you'd would react to something written about you this way. Anyone would love it, I bet. The dolls are an odd touch. Very cool blog - love it. And yes, I'd appreciate an odd entry like this written in homage to me.